With over 10 years experience, Wayne offers professional results with every job he is on. 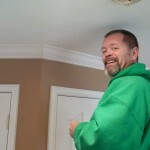 Repeat customers and people that refer us to others, always recommend Wayne be the painter that does the job. Whether it's interior or exterior, Wayne has all the skills.